One of the most pervasive, durable, and detrimental myths in transportation policy is that highways pay for themselves, while public transportation does not. In reality, both modes require significant public subsidies, as user fees—such as fuel taxes and farebox revenues—cover only a portion of total costs. States and the federal government supplement these user fees with property taxes, bonding, and general revenues. On average, these nonuser fee revenues represent 26 percent of total annual highway expenditures. Moreover, treating all highways equally obscures the fact that per-mile construction and maintenance costs, driving levels, and motor fuel tax revenues vary substantially depending on the location, size, and population around a particular road. While the overwhelming majority of driving occurs within metropolitan areas, many large urban highways and arterial roads cost substantially more money to maintain than they generate in fuel taxes. This is also true of many rural and exurban arterial roads. This means that states must cross subsidize thousands of miles of roads that generate insufficient gas tax revenues each year. 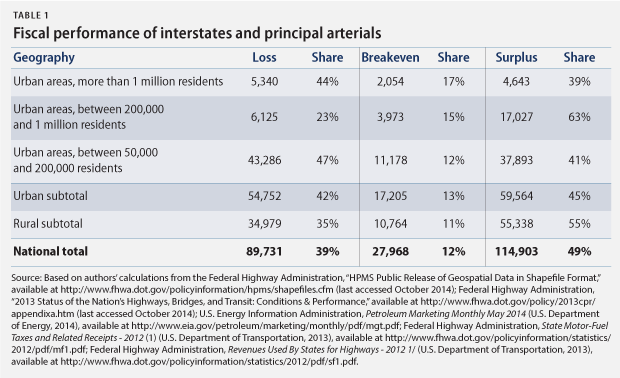 Research by the Center for American Progress shows that nearly 4 in 10 miles of interstate highway and other principal arterial roadways fail to generate enough in user fees to cover their long-term maintenance costs. For the purposes of this analysis, maintenance costs include one reconstruction and multiple resurfacings over the course of three decades while excluding the costs of land acquisition, engineering, construction, and inflation. 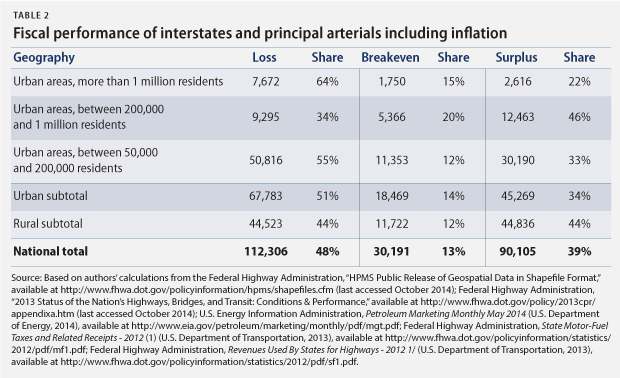 When the analysis is conducted assuming 1 percent annual inflation, the share of interstate and other principal arterial roadways that fail to cover their costs rises by more than 22,000 miles, or 9 percent. In all likelihood, actual construction inflation will be much higher than 1 percent per year over the next 30 years. Furthermore, if land acquisition and construction expenses were amortized over the same period, an even higher share of roadways would fail to cover their costs. This research also strongly suggests that an even higher share of minor arterial roadways, collectors, and other local roads fail to cover their long-term costs. A disproportionately large percentage of driving occurs on interstates and principal arterials—which make up the National Highway System, or NHS—relative to the rest of the roadway network. 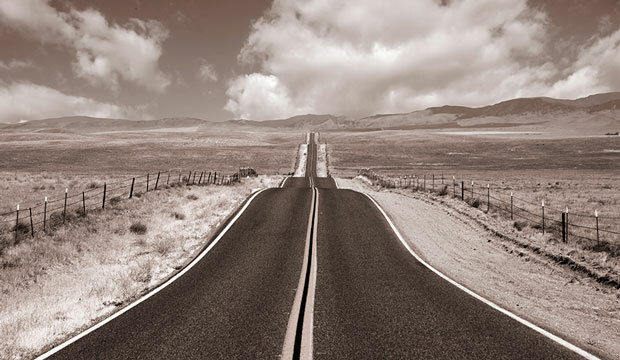 Data from the U.S. Department of Transportation’s Federal Highway Administration shows that the NHS accounts for only 5.5 percent of all roadway miles yet carries 55 percent of all vehicle miles traveled, or VMT, each year. As a result, the remaining 94 percent of the system generates much less user fee revenue on a per-mile basis, since it carries less than half of all driving. States and the federal government fund a substantial portion of their transportation expenditures by taxing the sale of gasoline and diesel fuel. Highway proponents have successfully enacted prohibitions against using fuel tax revenues to support public transportation and other multimodal projects in 30 states. At the federal level, there is an unofficial rule that no more than 20 percent of fuel tax revenue can support public transportation, also referred to as transit. These prohibitions and unofficial limits hamper the ability of states and metropolitan regions to effectively plan for future needs, as many worthwhile transit and multimodal projects languish due to a lack of funds. Highway boosters have exploited the myth of self-sufficiency to argue that fuel tax revenue should only fund highway and bridge projects. In effect, highway boosters argue that the source of the money should determine what that money builds. This approach misses that, in many urban areas, transit, passenger rail, or other multimodal projects are the most effective means of achieving an efficient, economically productive, equitable, and environmentally sustainable transportation system. While a roadway may produce an important share of transportation tax revenues, additional roadway construction may not be the most appropriate mobility solution. In short, objective measures of transportation system needs should determine transportation priorities regardless of the source of funds. In addition to the myth of highway user fee self-sufficiency, funding restrictions are predicated on the false notion that public transportation riders do not pay gas taxes and therefore do not pay into the system. The primary issue is the assumption that people who ride transit never drive. In fact, the vast majority of transit riders does indeed drive and, as a result, pays motor fuel taxes. A recent national survey by the American Public Transportation Association found that 82 percent of transit riders live in a household with a car. Of those transit riders with access to a car, 87 percent used the vehicle more than three times per week. As this research shows, driving and public transportation are complementary, with residents paying into the system that allows them the flexibility to choose the mode of transportation that meets their needs for any given trip. Beyond the issue of funding, transit provides significant benefits for people who exclusively drive, as public transportation lowers roadway congestion. In the absence of transit service, riders would be forced to drive for all trips, adding vehicles to the network during the peak periods of travel demand—the morning and the evening. 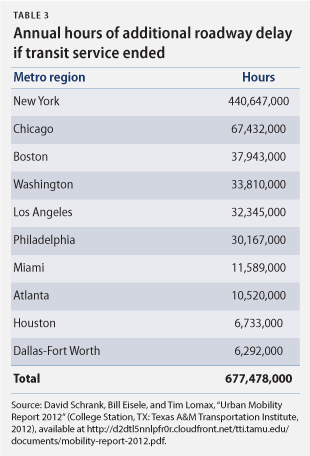 Research by Texas A&M University shows that if transit services were stopped in the top 10 largest metropolitan regions, it would increase roadway delay by 677 million hours each year. Yet prohibitions on the use of gas taxes to fund public transit mean that metropolitan and state transportation authorities are often denied the ability to implement a balanced surface transportation system capable of delivering the most benefits to residents and businesses. The negative consequences of funding restrictions are especially harmful in metropolitan areas with growing roadway congestion. Research shows that total hours of roadway delay in urban areas increased by 400 percent from 1982 to 2011. Yet state and local planners are often prevented from using user fee revenues, overwhelmingly generated by urban drivers, to improve the transportation system through balanced investment. Data from the Federal Highway Administration show that 67 percent of all VMT—or 1.9 trillion miles annually—occurs within urban areas. Urban drivers generate nearly $7 out of every $10 in user fees, but they face counterproductive restrictions regarding how those funds may be used. States and metropolitan regions should have the flexibility to implement needed transportation projects regardless of the source of funding. The U.S. surface transportation system is a complex mix of different modes, including highways, intercity passenger rail, public transportation, freight rail, and intermodal connections that allow freight to flow from ship to train and from train to truck. Funding restrictions at the state and federal levels represent a major barrier to successfully planning and implementing an efficient, equitable, sustainable, and globally competitive transportation system. Reforming surface transportation will require changes at the federal and state levels. Specifically, Congress should establish a multimodal account within the Highway Trust Fund to provide funding for highway, transit, passenger and freight rail, port development, and intermodal facilities, among other projects. Funding from this multimodal account should be distributed through a competitive program administered by the Department of Transportation’s Office of the Secretary. In addition, states should be given the flexibility to use any portion of their federal highway funds for any project category eligible under the multimodal program. At the state level, legislatures should repeal any statutory or state constitutional prohibitions that prevent the use of motor fuel taxes or other user fees for projects other than highways. Once these restrictions have been lifted, states should require their respective transportation departments to engage in scenario planning based upon achieving objectives and quantifiable system performance goals. Taken together, increased funding flexibility from Congress and state legislatures and goal-driven scenario planning will allow transportation agencies to implement a truly multimodal, integrated, and balanced system. Kevin DeGood is the Director of Infrastructure Policy at the Center for American Progress. Andrew Schwartz is pursuing a master’s of public affairs from the Lyndon B. Johnson School of Public Affairs at the University of Texas at Austin, where he is a graduate research fellow for Innovations for Peace and Development.